Delicious Pictures and Recipes from us to you! 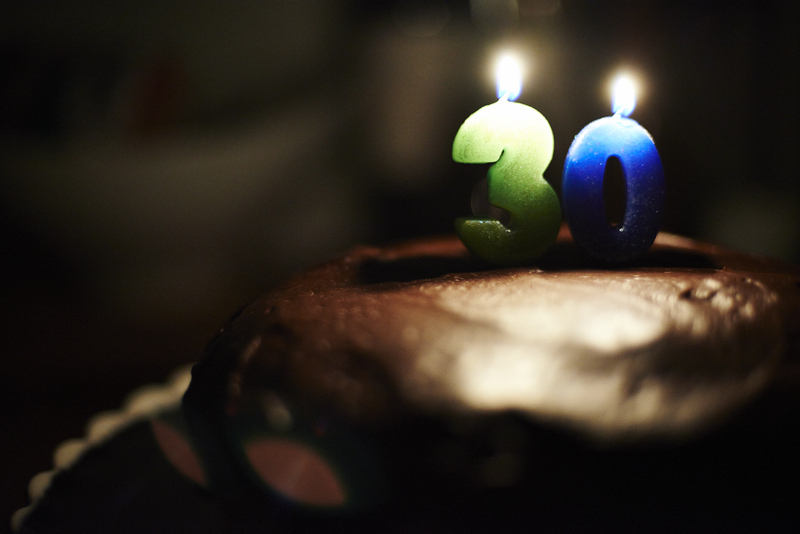 Jason is officially in his thirties! I just had to make my very special husband an extra special cake that would truly make his day extraordinary. I searched high and low and even considered buying a Portillo’s chocolate cake ( you know because it’s amazing, affordable and I am pregnant) but I really wanted to do something homemade, from the heart. 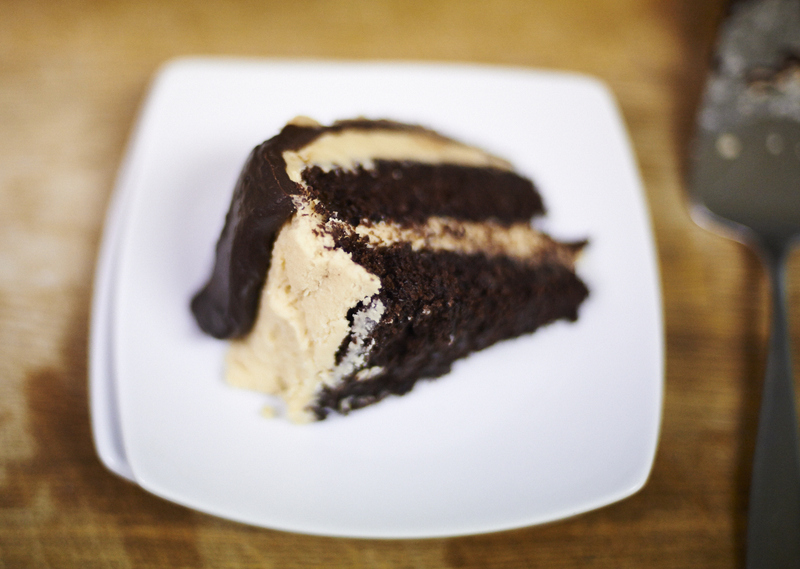 When I found this recipe, of course it’s Smitten Kitchen that could create something so perfect, so decadent: Chocolate Cake with Peanut Buttercream Frosting and Chocolate Genache, yes you read that correct, I knew it was perfect for my peanut butter loving husband that requested a chocolate cake with chocolate frosting. And holy cow, it was more than I, we, could ever imagine. I mean, think about the most amazing flavors, the richest moistest perfect cake, frosted with heavenly peanut butter(cream), and covered in more chocolate…. I can’t explain how amazing this is well enough, you just have to trust me and make this. Since it was just us for birthday cake this year ( after a night out with friends and family to celebrate of course) I cut the cake recipe in half, which worked perfect, except that it was still an entire cake and there’s just 2.5 of us eating it… we got our fill! I did make the full frosting recipe and had some left over, because cutting in in half made too little frosting. This serves 10 people easily, but if you want to serve more people use the original recipe from the link. This cake is INTENSE. Serve it with a nice glass of milk! 1. Preheat the oven to 350 degrees F. Butter the bottoms and sides of two 8-inch round cakepans. Line the bottom of each pan with a round of parchment paper and butter the paper. 2. Sift the flour, sugar, cocoa powder, baking soda, and salt into a large bowl. Whisk to combine them well. Add the oil and sour cream and whisk to blend. Gradually beat in the water. Blend in the vinegar and vanilla. Whisk in the eggs and beat until well blended. Scrape down the sides of the bowl and be sure the batter is well mixed. Divide evenly among the 2 prepared cake pans. 3. Bake for 30-35 minutes, or until a cake tester or wooden toothpick inserted in the center comes out almost clean. Let cool in the pans for about 5 minutes, cover the top of pans loosely with plastic wrap and place in freezer for 20 inures, this locks in the moisture and makes it easier to frost. Remove from freezer and invert onto wire racks, carefully peel off the paper liners. 5. 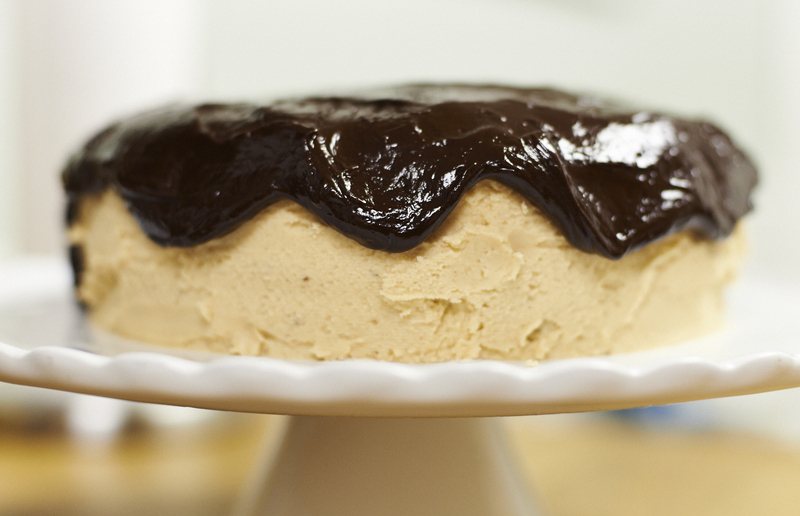 To decorate with the Chocolate–Peanut Butter Glaze, put the cake plate on a large baking sheet to catch any drips. Simply pour the glaze over the top of the cake, and using an offset spatula, spread it evenly over the top just to the edges so that it runs down the sides of the cake in long drips. Refrigerate, uncovered, for at least 30 minutes to allow the glaze and frosting to set completely. Remove about 1 hour before serving. Decorate the top with chopped peanut brittle. 1. In a large bowl with an electric mixer, beat the cream cheese and butter until light and fluffy. Gradually add the confectioners’ sugar 1 cup at a time, mixing thoroughly after each addition and scraping down the sides of the bowl often. Continue to beat on medium speed until light and fluffy, 3 to 4 minutes. 2. Add the peanut butter and beat until thoroughly blended. 1. In the top of a double boiler or in a bowl set over simmering water, combine the chocolate, peanut butter, and corn syrup. Cook, whisking often, until the chocolate is melted and the mixture is smooth. 2. Remove from the heat and whisk in the half-and-half, beating until smooth. Use while still warm. A little square of heaven, not a single one of these EVER goes to waste. This recipe is made from memory of a similar treat my friend’s mom used to make when I was in high school. I have no clue what her proportions were but recreating it was pretty simple, these are semi- homemade and SO delicious. 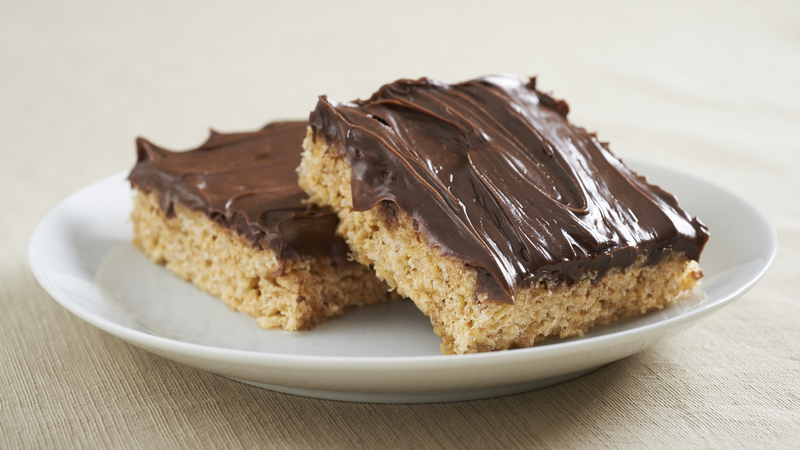 I like to think they are a healthier version of cookies/ cakes/ brownies, especially after finding the Rice Crispies brand makes Whole Grain Brown Rice Cripies. They work perfectly all topped with frosting and a hint of peanut butter, mmmm I wish I made more. 1. In large saucepan melt butter over low heat. Add marshmallows and stir until completely melted. Add in peanut butter to combine, then remove from heat.2. Add Rice Crispies cereal. Stir until well coated. 3. Using buttered hands evenly press mixture into 13 x 9 x 2-inch pan coated with cooking spray. Cool. 6. Scoop the batter onto the sheet pan using 2 spoons or a small ice cream scooper, and bake the cookies for 11 minutes. 7. Let the cookies cool on the sheet pan for 2 minutes before removing them to a cooling rack, then enjoy! In a large bowl, beat the cream cheese, butter and confectioners’ sugar until smooth. In a large bowl, whisk milk and pudding mixes for 2 minutes; let stand for 2 minutes or until soft-set. Gradually stir into cream cheese mixture. Fold in whipped topping. Spread 1-1/3 cups of crushed cookies into an ungreased 13-in. x 9-in. or Trifle dish. Layer with half of the pudding mixture and half of the remaining cookies. Repeat layers. Refrigerate for at least 1 hour before serving. 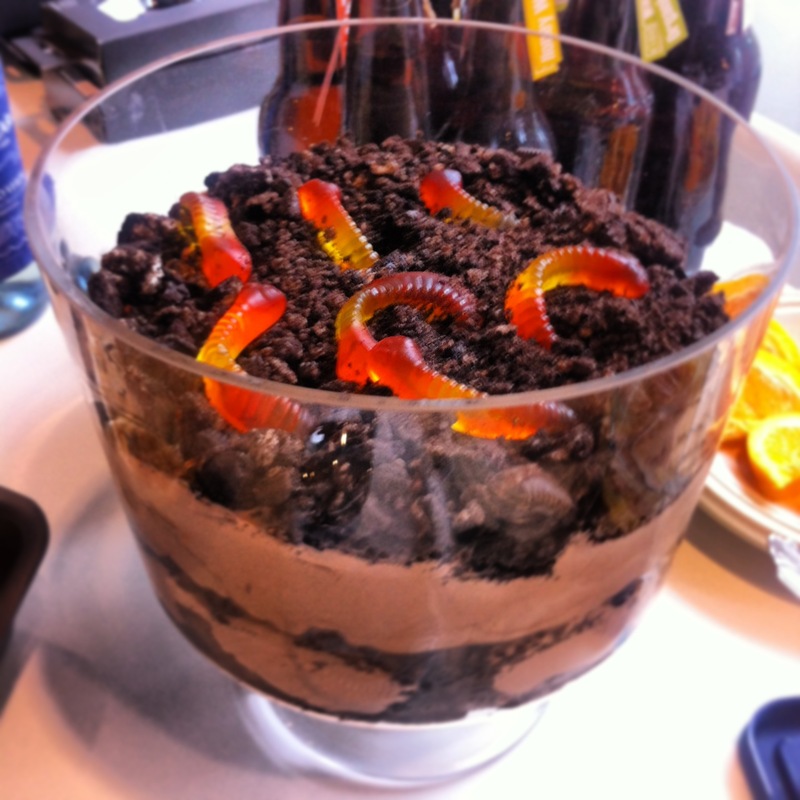 Serve with gummy worms if desired! Yield: 20 servings. Lindsay ( aka the green bean and an RD!) cooks on the weekends and preps snacks, grains, breakfast foods etc like us to make the week easier and healthy choices seamless. Whole real foods and grains- we’ve made the one ingredient ice cream before and LOVE figs and dates, so I went for this. I adapted it a bit from the original so if you like to see what change check out this awesome blog! And go ahead and make this, they are so so good. The chia seeds are optional but I like that it adds a crunch and nutrition to boot, if you want to use figs rather then dates you’d also get the same crunch and Yum…. 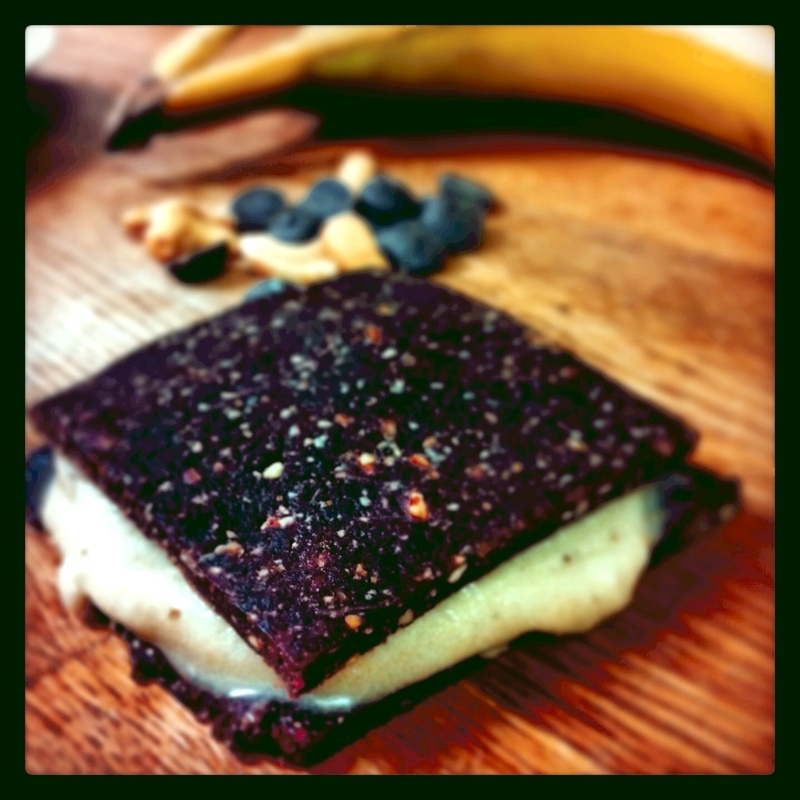 In a food processor, pulse dates, cashews, peanut butter, cocoa, chia seeds until combined and a crumbly mixture forms. Add water by teaspoon if mixture is too dry. Transfer mixture to a Saran covered jelly roll pan and flatten to about 1/4″ thickness trying to maintain a rectangular shape for uniform sandwiches; about 12″x16″. Cover and freeze for two hours. Meanwhile, clean food processor and combine bananas and almond milk. Pulse and process until smooth creamy consistency. Store in freezer until ready to assemble. To assemble cut with pizza cutter in to 16 equalish rectangles. Spoon about 2 tablespoons of banana cream on one piece, top with a second, wrap in Saran to store in freezer- repeat to complete and enjoy! Who doesn’t love cupcakes? I know I do, but I also don’t want to undo all my hard work at the gym. 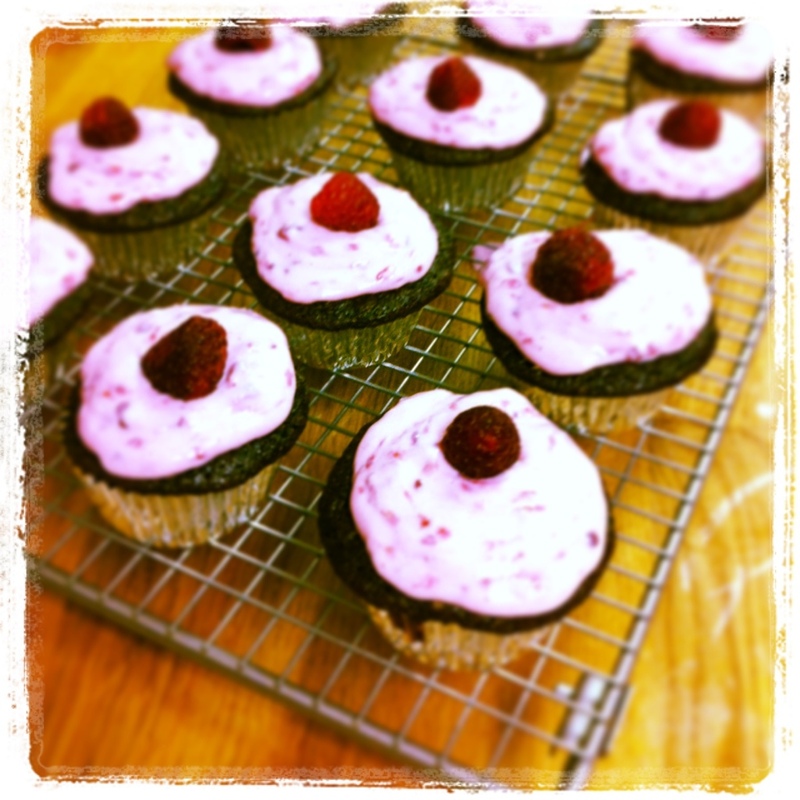 This recipe comes from a fun blogger fitfoodiefinds.com that makes some really inspiring healthified desserts, a fellow sweet tooth after dinner like us 🙂 It’s the first real recipe I have followed from her blog so I didn’t make any changes- these are so yummy, the cake was moist and spongy and the frosting was to die for- I love raspberries! Some updates for next time: I would use the stand mixer to beat the cake batter for 2 minutes so it’s less spongy and more cakey- flavor was perfect! Also, using 4 ounces of cream cheese and 1/3 cup yogurt for the frosting, mine was a little runny even after refrigeration. It also made extra frosting, so you could 1/2 the recipe for that entirely, and have enough for all 12 cupcakes. 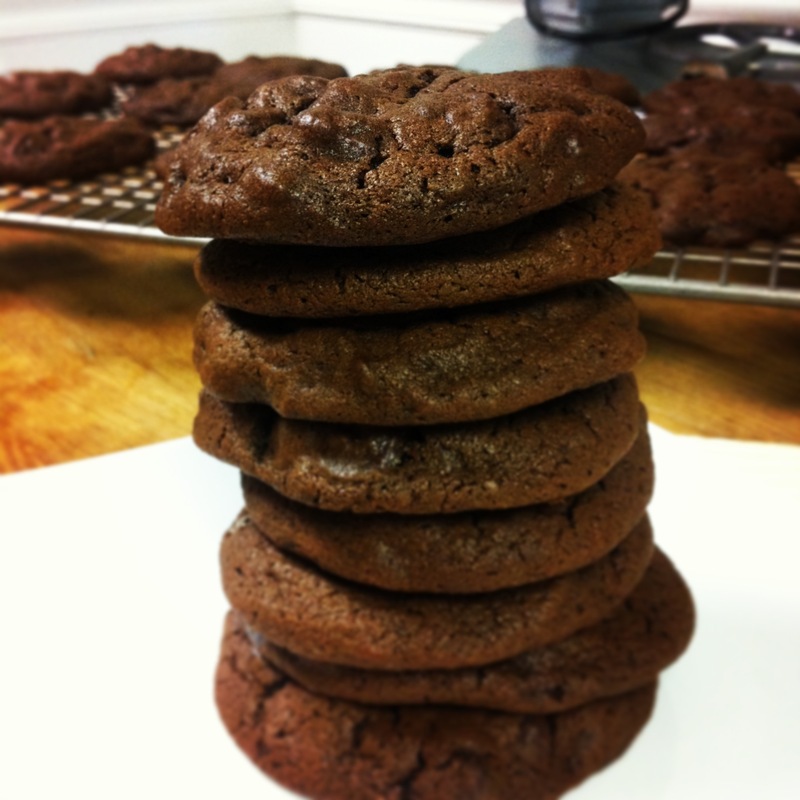 Follow original link for the original recipe, or trust us and make it with our updates, they are delicious! Preheat oven to 350F and line a cupcake pan with cupcake liners. Then, lightly spray with non-stick cooking spray and set aside. Fill each cup about 2/3 of the way full with the batter. 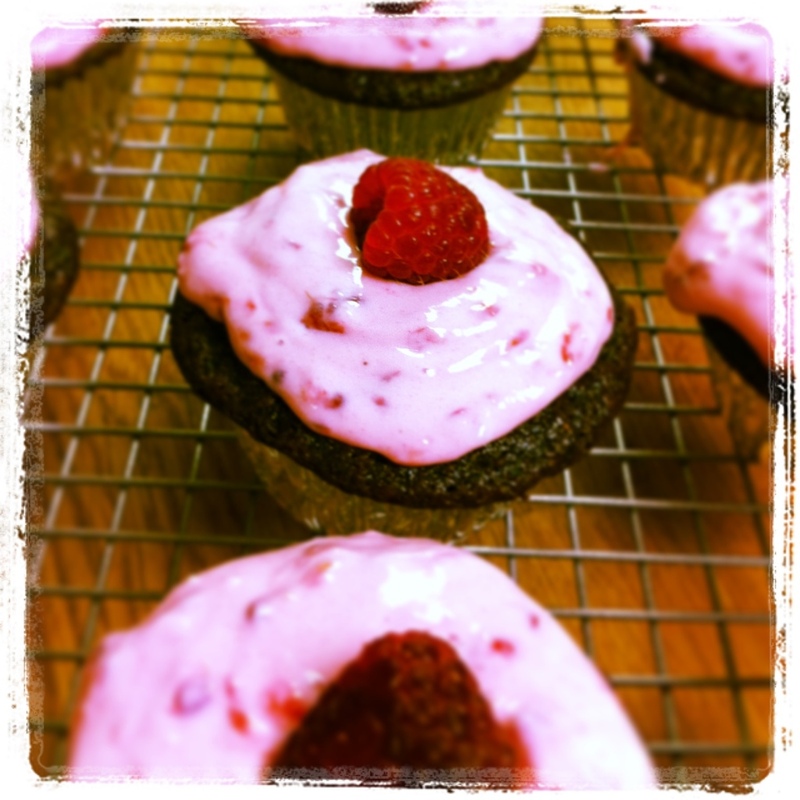 While your cupcakes are in the oven, prepare your Raspberry Cream Cheese Frosting. The frosting will need to sit in the refrigerator for about an hour before piping. In your stand mixer bowl, combine cream cheese, yogurt- Mix until there are no lumps. Slowly add in the powdered sugar till combined then beat on medium/high for 1-2 minutes till smooth. Then, add in fresh raspberries and mix again, breaking up the raspberries. Let sit in the refrigerator for about an hour. Once completely chilled, transfer to a piping bag ( or zip bag with corner cut off) and pipe frosting onto cooled cupcakes. Place a fresh raspberry on top for garnish. In a 4-quart saucepan, combine wine, sugar, orange juice, zest, cinnamon stick and cloves. Bring to a boil, reduce heat and simmer for 5 minutes. While liquid is simmering, peel pears, leaving stem intact and being careful not to blemish the flesh of the pears. Slice 1/2-inch off the bottom of the pears to create a flat bottom. Gently place pears in poaching liquid, cover, and simmer for 15 to 20 minutes, turning every 5 minutes to ensure even color, until pears are cooked but still firm. 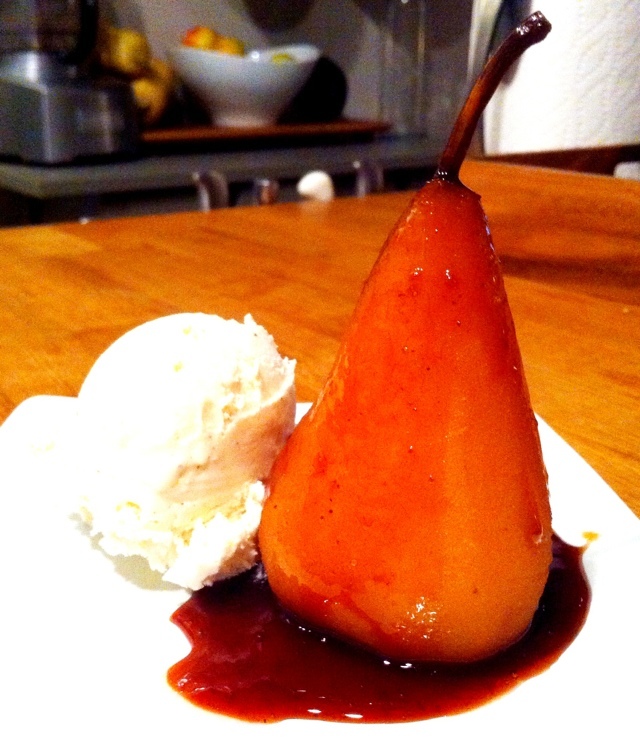 Remove saucepan from flame, uncover and cool with pears upright in pan. Once cool, cover and chill in refrigerator at least 3 hours or up to 24 hours, turning occasionally, if desired. Gently remove pears from liquid and allow to come to room temperature. Meanwhile, reduce liquid by about half over a medium-high flame for 15 minutes, until liquid is thicker and slightly syrupy. Remove from flame and let liquid come to room temperature. Drizzle each pear with 2 tablespoons syrup and serve.